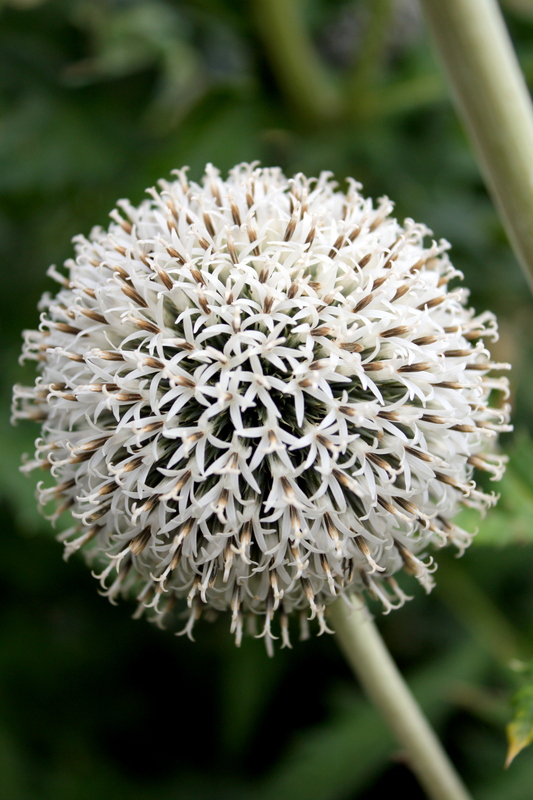 Forming a perfect, filigree sphere this is the flower head of Echinops ritro ‘White Globe’. I can’t recall why I omitted this work of nature’s art from my original post about Tintinhull, but now seems a fitting time to rescue it from digital oblivion. Echinops (globe thistles) are members of the aster family, but gone are the familiar daisy-like flowers, replaced instead with tiny trumpets radiating out from a central boss. Bees of all kinds love them, plundering the miniature globes for every drop of nectar. In bud the flowers are more aggressively thistle-like – sharply pointed and gleaming silver-white in the sun. In spite of their remarkably delicate flowers, globe thistles are as tough as old boots, tolerating poor, dry soils and anything the British weather can throw at them.